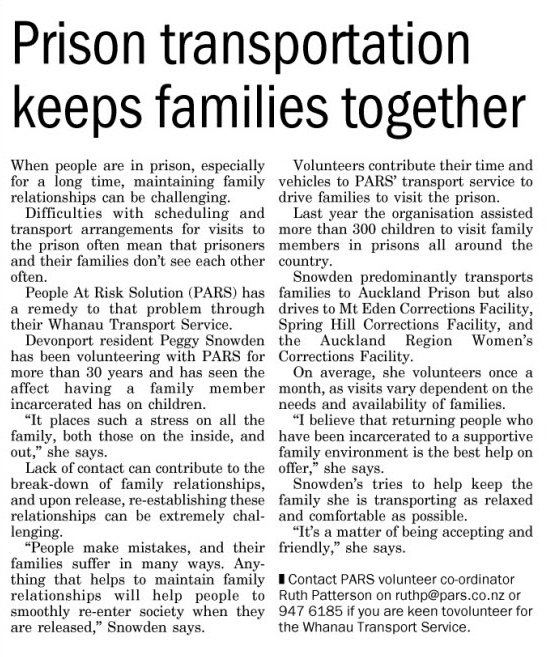 An article from the North Shore Times about PARS volunteers who contribute their time and vehicles to help families visit loved ones in prison. When people are in prison, especially for a long time, maintaining family relationships can be challenging. Difficulties with scheduling and transport arrangements for visits to the prison often mean that prisoners and their families don’t see each other often. People At Risk Solution (PARS) has a remedy to that problem through their Whanau Transport Service. Devonport resident Peggy Snowden has been volunteering with PARS for more than 30 years and has seen the affect having a family member incarcerated has on children. “It places such a stress on all the family, both those on the inside, and out,” she says. Lack of contact can contribute to the break-down of family relationships, and upon release, re-establishing these relationships can be extremely challenging. “People make mistakes, and their families suffer in many ways. Anything that helps to maintain family relationships will help people to smoothly re-enter society when they are released,” Snowden says. Volunteers contribute their time and vehicles to PARS’ transport service to drive families to visit the prison. Last year the organisation assisted more than 300 children to visit family members in prisons all around the country. Snowden predominantly transports families to Auckland Prison but also drives to Mt Eden Corrections Facility, Spring Hill Corrections Facility, and the Auckland Region Women’s Corrections Facility. On average, she volunteers once a month, as visits vary dependent on the needs and availability of families. “I believe that returning people who have been incarcerated to a supportive family environment is the best help on offer,” she says. Snowden’s tries to help keep the family she is transporting as relaxed and comfortable as possible. “It’s a matter of being accepting and friendly,” she says.